L.A. Castle, of After 55, outgoing president and member of the Towne Centre Chapter was honored on Saturday, Dec. 4th at a Banquet for the “Spirit of Love” Award at the Berwick Manor Party House. She was recognized for outstanding work in the community. And recommended by Phyllis Viney from the Marion Franklin Senior Center on the South side of Columbus. This award was presented by Youth Connections who recognize youth and adults who do outstanding work in their communities. She was also given certificates signed by Columbus City Council and the Mayor. She stated “I was very humbled by this honor and appreciate the acknowledgement of my passion for seniors who need our resources to be safe and happy.” L.A. was presented a crystal award with her name inscribed. You should always make your mailings look personal. Personal-looking, first-class mail, always, always gets opened…especially, if it’s Federal Express mail. As much as 75% of bulk mail, which is really junk mail, gets thrown out, without ever getting opened. This is important to remember. So, even if you only handwrite the address on the envelope, it will look more personal and chances are that it will be opened. Also, use regular stamps on the envelopes. Don’t use the bulk rate stamps. But if you must use bulk rate stamps, do your best to make the rest of the envelope look like personal mail…stay away from the bulk mail look. And if you want to increase the chances of your mail being opened, send it by Federal Express. Of course, this is a lot more expensive to do. But if you are mailing to high-value prospects, especially those with a high lifetime value, then this is one way to increase the probability of getting your mail read. If you are not entirely comfortable at events that are solely networking in nature, you are not alone. With no formal agenda or mission (other than networking), the setting can be intimidating. Nevertheless, you still must network. Here is a solution, try to attend gatherings that have more of a purpose. Activities such as educational or cultural seminars, interactive classes and workshops have the benefit of providing intellectual content as well as purposeful networking among those with similar interests. Plus, in these situations you can use the program content as a great jumping off point for conversation. Jim Dorenbusch, owner of Junction Architecture & Design, LLC and member of the Granville Chapter, was featured in an article on Buildipedia.com. A house designed by Jim was chosen as the Buildipedia.com House of the Month. 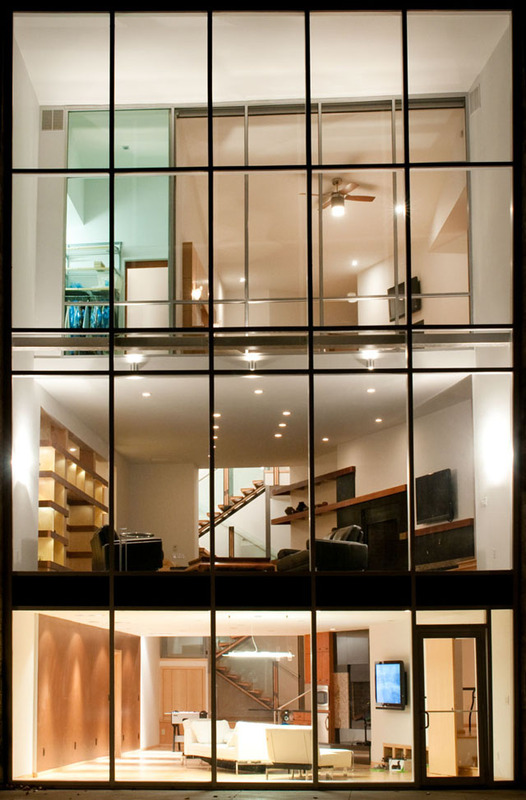 The article details a unique modern home that Jim designed for a Granville resident. 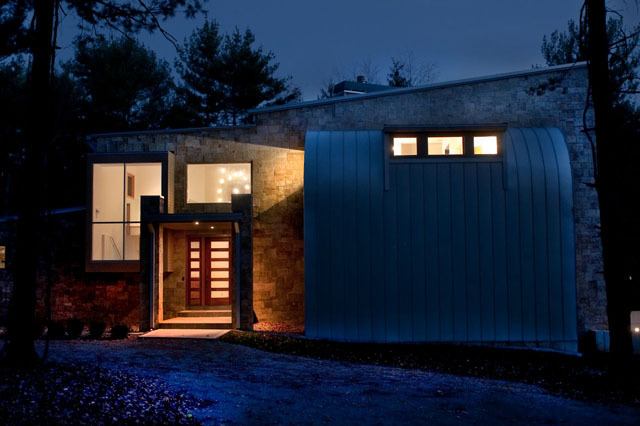 To read the article go to http://buildipedia.com/at-home/design-ideas/item/1330-house-of-the-mont-scandinavian-modernism-in-the-midwest. The last thing a potential buyer sees in your sales material is your order form. That is your last chance to make the sale … to remind the potential buyer why owning your product is a smart decision for him. So it’s imperative that you re-state the main points of your offer in the form. Remind the buyer how much he’ll save, how good he’ll feel, why getting it now is a great idea, etc. Your order form is one of the critical elements of the sales process, so don’t design it as an afterthought. Put as much forethought into it as possible. 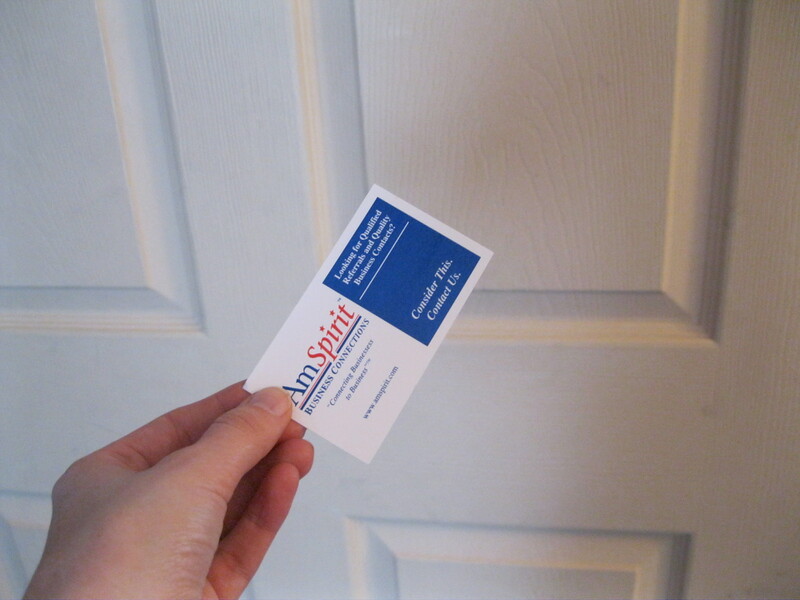 This is especially important when you do direct mail. On Thursday, December 9th, 2010, members of the Executive Chapter of AmSpirit Business Connections (based in Columbus, Ohio) took a 100-mile field trip to Cincinnati. 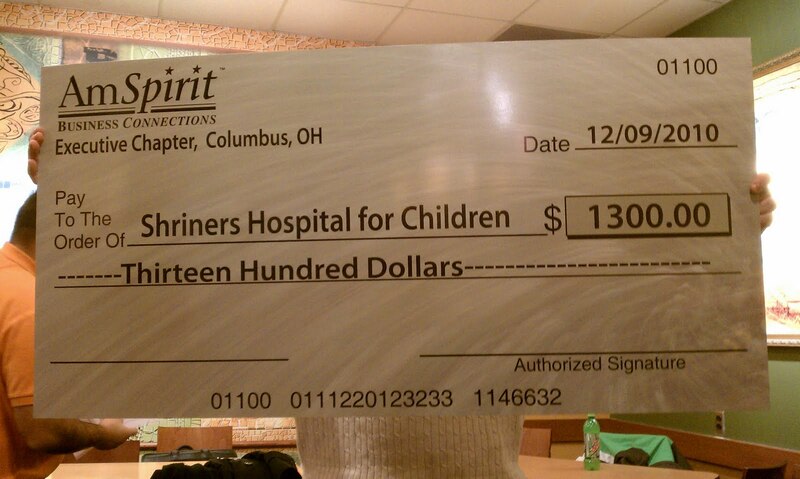 It made the trek to not just tour the Cincinnati Shriners Hospital, but to also make a $1,300 contribution to its cause. Shriners Hospitals for Children® is a health care system of 22 hospitals dedicated to improving the lives of children by providing pediatric specialty care, innovative research, and outstanding teaching programs for medical professionals. Children up to age 18 with orthopaedic conditions, burns, spinal cord injuries, and cleft lip and palate are eligible for care and receive all services in a family-centered environment, regardless of the patients’ ability to pay. It’s how Shriners Hospitals for Children® has been Changing the World through Caring for Kids since 1922. The Executive Chapter raised these monies this past fall at an event it hosted at the Aladdin Shrine Center in Columbus, Ohio. The Executive Chapter meets every Thursday morning at 7:45 am and is certified as an Outstanding Chapter within the AmSpirit Business Connections system. To learn more about the Chapter and its members, visit http://www.amspirit.com/chapter.php?chapter=Executive. An important rule of networking is give to others. This, often, then begs the question, What should I give? What you give to your network can include business referrals, your own business and even a traditional gift. But it does not have to be limited to those items. Introductions to others are of great value. Information can be priceless (even if it might seem useless to you). Often equally as valuable is your time … listening … being consultative … or just offering your encouragement. These are remembered long after the gift card is spent or that funky tie is no longer cute. As we are reminded each and every holiday season, it is the thought that counts … and this holds true in the professional networking environment as well. Remember this relationship rule? Do onto others as you would have them do onto you? Change it to: Do onto others as they WANT to be done onto. What this really means is that you should find out from your potential customers what they want and how they want to receive it. Do the research. This is extremely important. Without this information, you are marketing into a vacuum. Without this, your wonderfully designed product, with its eye-grabbing features, and emotionally-infused copy will nonetheless be rejected by your prospects. Why? Because, it’s not what they want, or they are not getting it the way they want it. 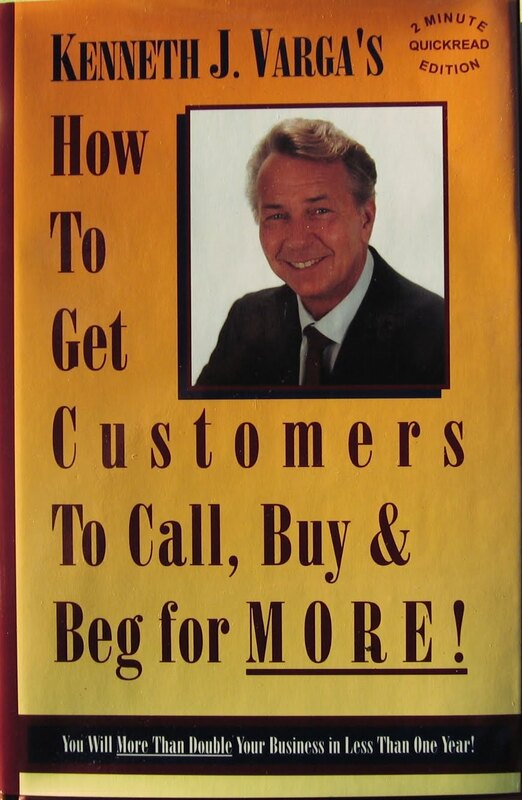 So just ask your customers what they want and how they want it. And always be observing them, because oftentimes what people say they want and what they REALLY want are different. You need to be always doing this. It’s not something you ask once, get the answer to, and then go implement it. It’s a mindset that has to be on all the time. That was great advice when you were just a kid. In your innocence, this message served to protect you from unspeakable dangers. Today, however, you operate in a more mature environment. While there is still unspeakable peril around, it is less of a threat in our adult life. And we now know that not all strangers lurk in the shadows looking to do us harm. On the contrary, in the grown-up world, strangers have the potential to become good friends, long-term clients, and bridges to new experiences and other people. So if you are looking to advance your networking efforts, seek out a stranger and talk to them. Shhh … dear old Mom will never know.